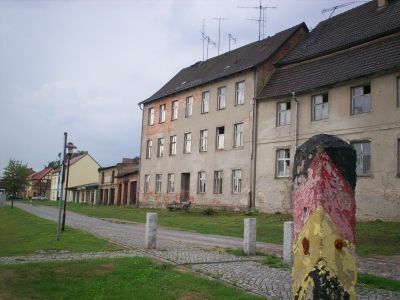 Und noch so ein Ort direkt an der Grenze zu Polen von wo einst eine alte Pflasterstein-Allee über die Oder führte. In der Verlängerung der gesprengten Brücke ist die ehemalige Strasse nur noch zu erahnen, denn die Alleebäume sind mittlerweile von Wald umgeben. Die Oder erscheint weit, ein Gebiet von Röricht und Wasser durchzogen, idyllisch mit unbekanntem Vogelgeschrei und der Nebel kriecht übers Schwemmbebiet. Im Dämmerlicht wird es unheimlich still, weil der Wald jedes Restgeräusch verschluckt. Nichts außer flaches grünes Land, breite Strassen werden an der Grenze zum Feldweg. Hier hat es Platz soweit das Auge reicht: leerstehende LPGs gähnen träge in der Landschaft. Offensichtlich findet man hier Ruhe, wie mir etliche gestresste Berliner mitteilen, und ein bisschen weiter, gleich drüben über der Grenze, alles was man will zu billigen Preisen. Deshalb geht man über die Grenze, und ansonsten, wie es scheint, wegen nichts anderem. Auf diese Weise schießen sich die Ostdeutschen selbst ins Knie, ihre gewachsene Infrastruktur weiter vernachlässigend, auf der Suche nach den gesparten Eurocents, die aber teuer erkauft werden. Paradox klingt es schon, kommt der Wahrheit aber ziemlich nahe. Und deshalb gibts in Polen an der Grenze alles und auf der anderen Seite nichts. Towns are characters, just like people they differ in looks, attitude and spirit; Angermünde feels medieavl without any straight roofline, some houses to die, some to be restored, the majority old but better than than when new. Unexpecetdly and somewhat surprising there are a lot of small workshops in one of the many backyards, small enterprises are virtually everywhere , certainly not a lethargic place at all. Schwedt appears completely different. Surrounded by large industrial estates people have a real chance to find work, but it doesn't make them happier, in Schwedt you hardly get a smile. Socalist housing estates, all looking the same, plaques of socialist achievers and heroes not only carry an echo of the past but, in a a quirky way, represent the spirit of the here and now. In Gartz you drive through the old DDR, if it wasn't for the painted houses and the cars in the streets and a number of supermarkets you would think nothing has changed in the last seventeen years. Coming from Prenzlau, after a short stop in a tiny village called Schmölln for coffee where I listen to a political rant delivered by a local farmer, I approach Löcknitz, situated directly at the border crossing Linken. 4.35 Euro for a lovely dish and one for a beer, it is apparent I am far away from any well trotten tourist track. Then Szczecin hits me with its city flair, some areas quite similar to quarters in Berlin, and with so many people in the streets, with its new and old houses in agreement it seems its 300000 inhabitants are on mission future positive. Buses still display the logos of German cities, the trams are full, the traffic battling its way in and out of the roundabouts: drivers shout at each other, then zoom out of town and accelerate even more. Many new houses are built outside the city, and the market estates lose their shabbyness, instead they make an effort of presenting their goods as tastfully arranged exhibits. The old town of course attracts the night life, the night life the thugs and thieves, the thieves the police: Nowhere else on this journey I have been in such a heavily policed area. Further towards the northern end of Poland I vanish in the lush forests of the Puszcza Wkrzanska, guarded by the virgin Mary and her many sisters. And then I'm back in Germany, over roads lined by NPD posters (it's enough!) towards Ueckermünde where I find a temporary home.But more on that later.